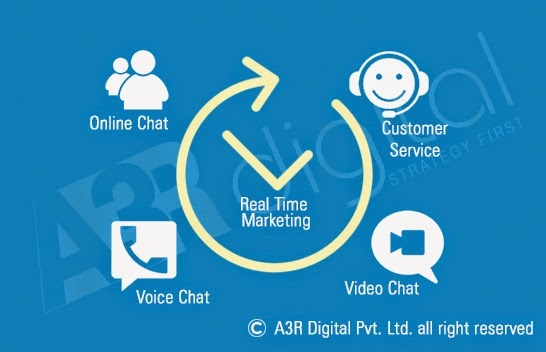 Real Time Marketing is a new buzzword in the digital marketing industry. Companies have gone beyond Digital first, Mobile first to the philosophy of “We First” in front of the customers….How many time you might have realized that if there are 50,000 unique visitors on your website and you could interact with each one of them? Now it is possible with the power and tools of digital marketing. There are a number of tools, technologies and companies who have now started offering Real-time marketing. We at a3R Digital are committed to your success. In case you feel that you need to have online engagement and conversions with your customers, while he is surfing your website and you would want to delight customer s by offering your service first before he switches to a competitor website. Then please drop in an email to a3rdigital@gmail.com or speak with me directly at 0091-8130940808 for booking a half a day consulting session on how Real-Time Marketing could help you generate more online sales and conversions and how you could create an online demand generation centre within your office.